www.reddotawards.com now points to a new 2013-2014 website. The Goodreads Groups -- one per category -- are set up as well. All the links are via the Google Site. You can start discussions on the Goodreads groups. The only thing still not done are posters, bookmarks, stickers, etc. -- i.e., promotional materials. If you feel like making some and sharing them, great. Otherwise wait a few weeks and I'll have my staff make some -- and put them up on the website. Remember: Voting starts Wed March 5, 2014, and will run for one week. The Readers Cup competition isn't until mid-May (date to be determined by who is hosting it). The books for the competition are a subset of the 8 titles in each category -- and aren't chosen until after the general winners are announced in March. So the goal now is just to have kids read the books -- and enjoy them. The voting is purely personal on the part of the student. Their favorite book on whatever basis they want. There are slideshows of the book covers in our network Picasa Web Album -- accessible via the site -- and below. And don't hesitate to be watching for books to go on next year's long lists and shortlists... Click here for links to the 2014-2015 Goodreads Listopia lists already set up. Red Dot Shortlists 2013-2014 -- DONE! Fixed the link mix-up -- where both the Early and Younger links above went to the Early list. 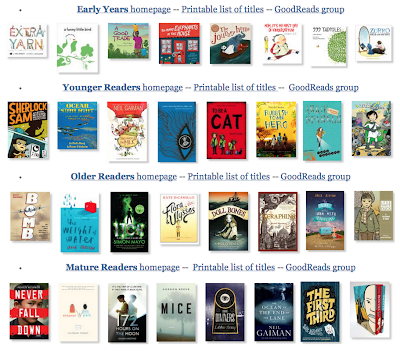 The Younger Readers shortlist should now be appearing correctly. Bookaburra is happy to provide books, especially the Australian ones. For example, they will be ordering in multiple copies of "First Third" by Will Kostakis on the Mature list. Email Cheryle Hum: enquiries@bookaburra.com . Book Depository -- free shipping. Fishpond.com.sg -- also free shipping. They sometimes have Aussie/NZ books that Book Depository doesn't (e.g., "First Third" by Will Kostakis).